The European Union in the 21st century. Political, legal, financial, social aspects of the future of the European Union. This interdisciplinary and cross-cultural meeting welcomes presentations on the cultural studies, sociology, geography, political science, law, history and economics research and cross border cooperation within the European Union and its wider region. 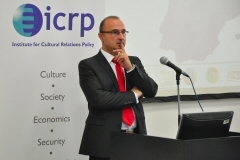 The conference is initiated by the Institute for Cultural Relations Policy (ICRP) and hosted by Kodolányi János University of Applied Sciences (KJU). Its aim is to serve as a meeting point to facilitate the public exposure of the perspectives and interests of different communities, governments, international organisations, NGOs, businesses, scholars, thinkers and common citizens. • Further European integration: How far to enlarge? • European Union: New regionalism? • Cultural pluralism in the EU: National or European identity? • New horizons: Multi-speed Europe? The two-days conference includes lectures of invited speakers and presentations of guest speakers. Invited speakers include diplomats, scholars, acting and former leading politicians or government officials from across Central and Eastern Europe. Former Hungarian Minister of Foreign Affairs, former ambassador of Hungary to Denmark and Germany, former European Commissioner holding the Regional Policy portfolio. 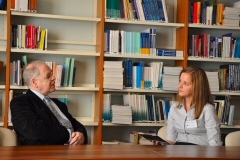 Professor at the International Relations and European Studies Department of the Central European University (CEU), Budapest. Member of the European Parliament, member in the Parliament’s Constitutional Affairs Committee (AFCO) and Foreign Affairs Committee (AFET). Until recently he was teaching at the University of London and the University of Bologna, Italy. Ambassador of the Republic of Poland to Hungary. ► H.E. Gordan GRLIĆ RADMAN, Dr. Ambassador of the Republic of Croatia to Hungary. Director, Department for EU Justice and Home Affairs and Enlargement, MFA, Hungary. ► Gyöngyvér HERVAINÉ SZABÓ, CSc. Dr. habil. Scientific Director of Kodolányi János University of Applied Sciences. EU Regional Coordinator of OCEANS Network. Best presentations will be selected by a panel of judges and awarded during the closing ceremony. Submitted and confirmed papers will be published online and will be archived on DVDs. In case of large number of participants, papers will be published in conference book as well. Gyöngyvér HERVAINÉ SZABÓ, CSc. Dr. habil. Péter BALÁZS, DSc. Dr. habil. New horizons: the EU as a global power I.
H.E. 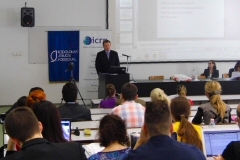 Gordan GRLIC RADMAN, Dr.
New horizons: the EU as a global power II. The ICRP is willing to publish a Book of Studies containing the papers which have been selected for the conference. The publication of papers is included in the registration fee. The Book of Studies will be published on CD (pdf format, with ISBN number) and online at ICRP website. • To get more knowledge about the prospects for the European Union. The application is a two-step procedure and it includes the submission of Registration Form toconference@culturalrelations.org and payment of registration fee (25 EUR + 15 EUR money transfer fee*). Deadline of submission & payment: 15 October, 2013. How to apply for English paper presentation? The application is a two-step procedure and it includes the submission of Registration Form toconference@culturalrelations.org and payment of registration fee (45 EUR + 15 EUR money transfer fee*). Deadline of submission: 15 October, 2013. Authors will be notified of conditional acceptance or rejection within 5 working days after submission. Registration fee shall be paid by bank transfer or cheque prior to event or at the same time as first day registration. * NOTE that the international money transfer fee is 15 EUR. If you intend to transfer the conference fee outside Hungary the total sum will be 40 EUR for listener registration and 60 EUR for speakers. In order to reduce money transfer costs, speakers are entitled to make payment in cash during the registration (original speaker registration fee 45 EUR). Deadlines for publishing: the abstracts sent upon registration will be included in the Abstracts Booklet published for the conference. Full papers will also published on CD and online on the event’s webpage (if paper received by final deadline, 31 December 2013). Registration fees for the full conference include one copy of conference materials and covers the cost of refreshments, and all conference activities. These items are not separately priced. Papers are invited on the topics outlined and others falling within the scope of the meeting. The conference fee does not include public transport and accommodation fees. Co-authors and groups: Please note that in case of group registration and papers with co-authors all registration fees are per person. Public transportation: ICRP is happy to purchase Budapest transportation ticket upon request. A Budapest 24-hour travel card costs 6 euros and Budapest 72-hour travel card costs 15 euros. If you would like us to buy any of these travel cards for you please transfer the additional sum (6 or 15 euros) with the participation cost. Please transfer the accommodation and transportation cost together with the participation cost. Accomodation: The ICRP is ready to suggest first class, mid-range and low budget hotels in Budapest. In absentia presentations are possible under some conditions. In case of presenting in absentia the abstract of your paper will be included in the Abstracts Booklet. Your full paper will be included in the conference DVD published for the conference (if paper received by 31 December). The full paper will also published online on the event’s webpage. The attendance certificate can be given only to those who attend the conference, however we can email you a certificate (upon request) showing that your paper was presented “in absentia.” Registration fee for in absentia presentation is 60 EUR (plus 15 EUR international money transfer fee). Language: The conference language is English. No translation services will be available. Dinner: During the event, the ICRP is pleased to offer you optional social activity in the evening of the 25th October by organising a group dinner in a restaurant. Should you wish to attend this event, you will be required to indicate your choice prior to event or at the same time as first day registration. The group dinner costs 15 EUR. In order to finalize the number of participants at the restaurant, we encourage you to decide in advance if you would like to attend this meal (warmly recommended). 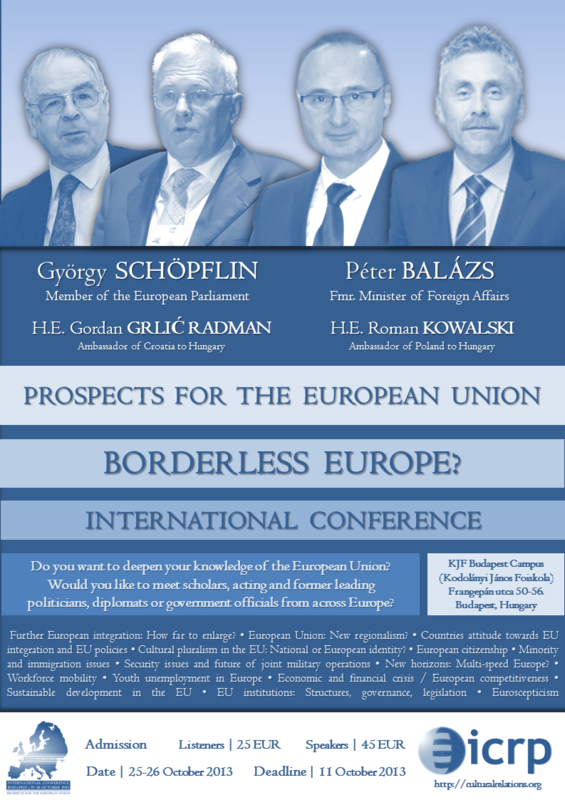 Prospects for the European Union: Borderless Europe? Gyöngyvér Hervainé Szabó, CSc. Dr. habil. : Well-being for Borderless Europe: a New Vision or Just an Illusion? Is there a way out of the euro? Adrienn Johanna Fehér: Cultural pluralism in the EU: national or European identity?